Dorset has all the elements for great camping and glamping holidays which is why it’s been attracting people for generations: a magnificent, largely unspoilt coastline and beautiful countryside as well as the potential for great days out at its many attractions. A genuine Mongolian yurt, nearest to the utility block. A handpainted Mongolian yurt only 30 meters from the utility block. 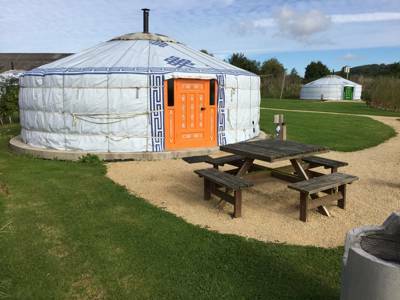 A genuine Mongolian yurt situated in the middle of the camp, approximately 50 metres from the utility block. 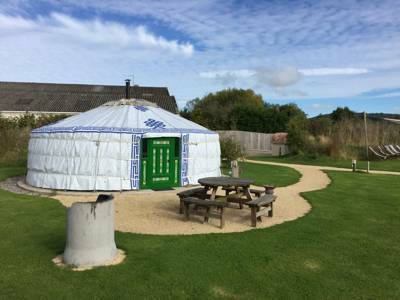 A genuine Mongolian yurt situated at the lower part of the camp with slightly more privacy, approximately 65 metres from the utility block. 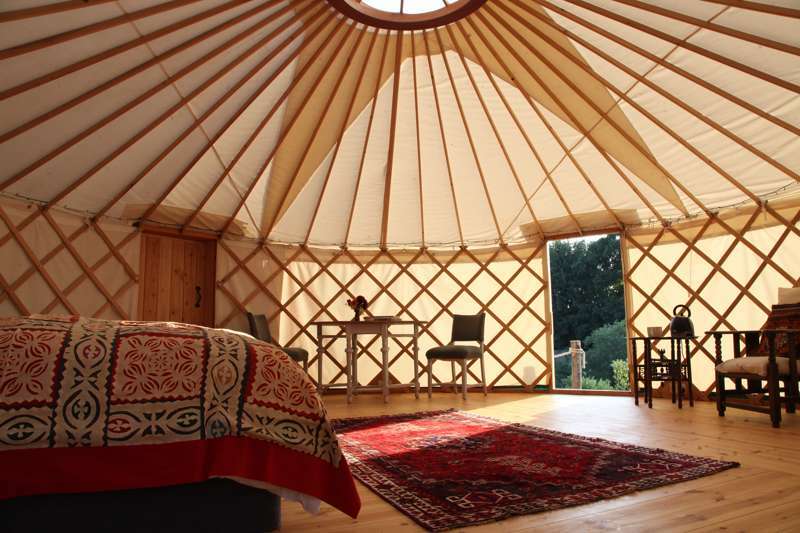 A large, timber-decked six-metre Yurt, comfortably sleeping four a piece and fully-equipped with everything you'll need. Each bell tent is equipped with a wood burning stove which can be lit in the evening to keep your tent warm and cosy, whatever the weather. 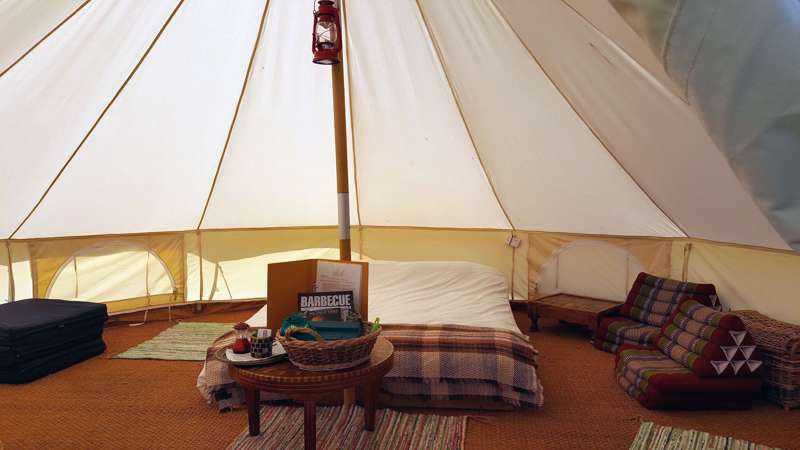 Each bell tent is beautifully furnished, carpeted with coir mats and rugs and solar fairy lights twinkle on the guy ropes creating a lovely ambience. 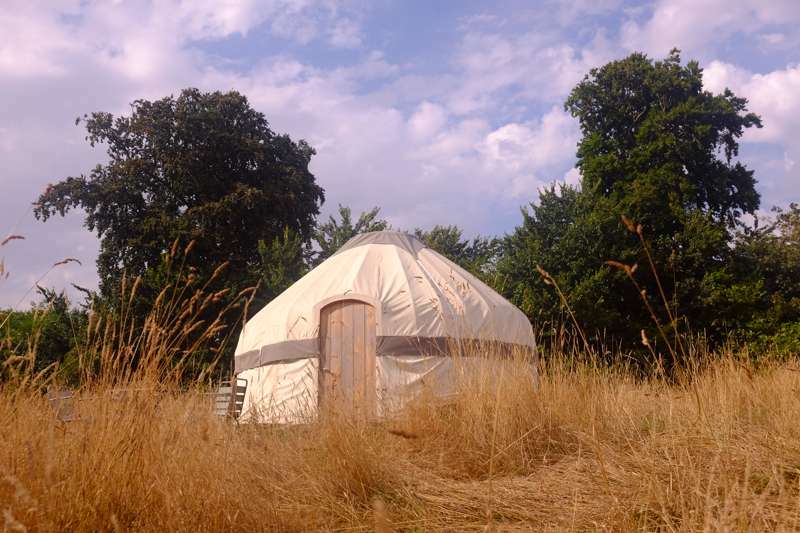 Russet Yurt is a luxury en-suite yurt set on a large raised sawn larch deck on a beautiful secluded farm in West Dorset. With a super king vi-spring bed, a luxurious en-suite with a piping hot shower, a proper flushing loo and a sink with a backlit light above, Russet offers you a truly luxurious glamping experience you won't forget. 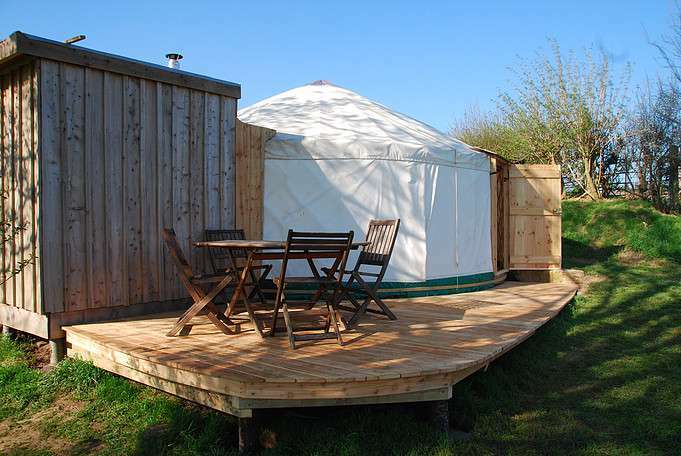 Pippin is a luxury en-suite yurt set on a large raised sawn larch deck on a beautiful secluded farm in West Dorset. With a sumptuous super king bed, a luxurious en-suite with a piping hot shower, a proper flushing loo and a sink with a backlit light above, Pippin offers you a truly luxurious glamping experience you won't forget. Tucked away in its own secret glade at Dorset Forest Garden in beautiful West Dorset. It has its own campfire and private hot tub. You can use theBBQ hut which is a fun to use what ever the weather. 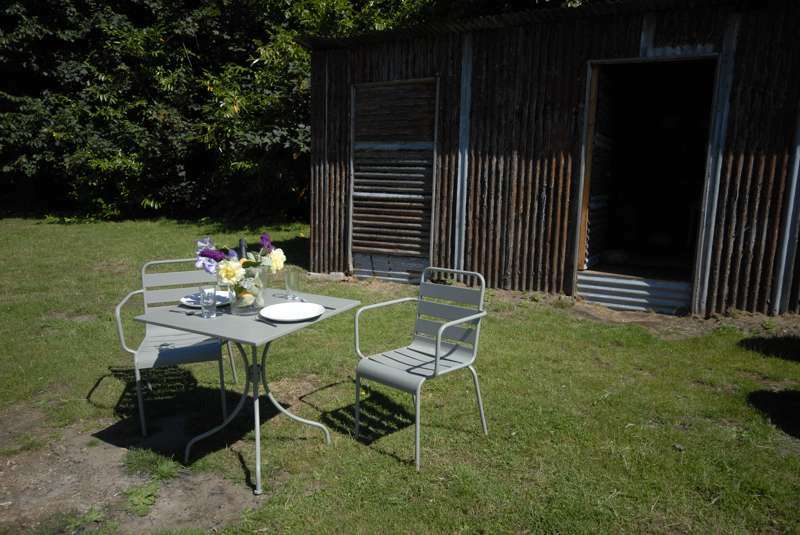 The hut has a king size bed with feather bedding woodburner, and ensuite shower and flushing loo. 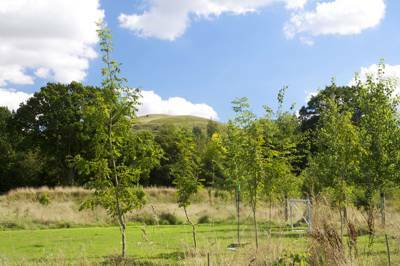 Central in Dorset Forest Garden with stunning far reaching views over rolling West Dorset countryside. Dark skies make it perfect for star gazing from your own private hot tub. You can use theBBQ hut which is a fun to use what ever the weather. The hut has a king size bed with feather bedding woodburner, and ensuite shower and flushing loo. 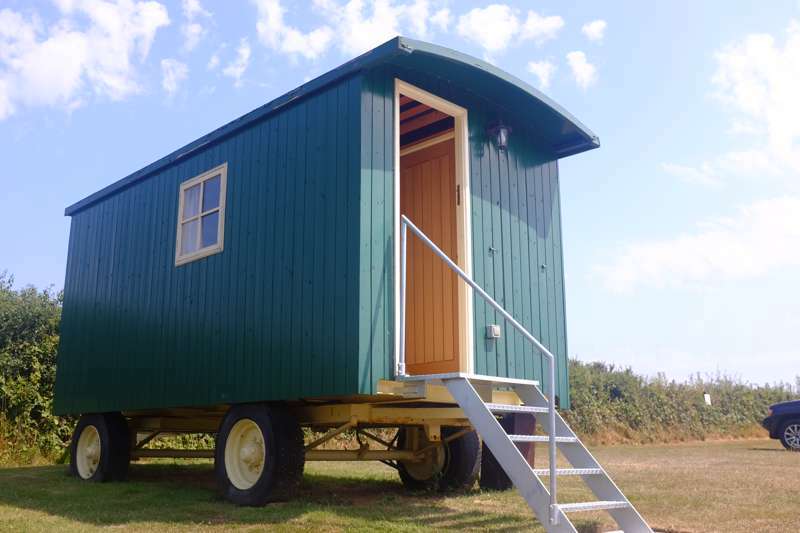 A rustic shepherd hut providing a real bed, a kitchenette with mod cons and an ensuite toilet for those not quite ready to give up on all of home comforts. A perfect retreat for couples searching for a secluded getaway with stunning countryside views. 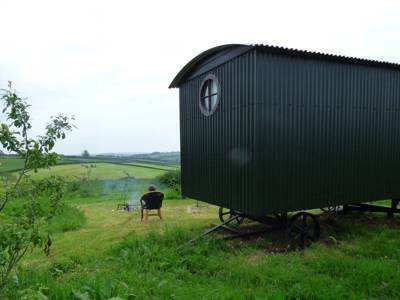 This modern Shepherds hut offers a cosy woodburner, firepit, outside kitchen and garden furniture. Located on a working farm with glorious walks and within easy reach of the Jurassic coast. A traditional Shepherds Hut situated in a private, peaceful location at the end of a woodland walk in the grounds of Laverstock Farm. 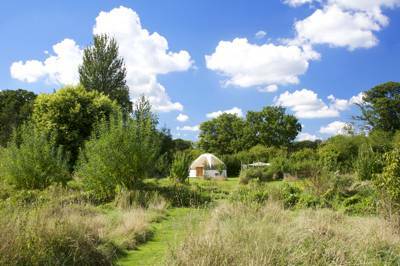 The Hut is ideal for 2 people with a double bed and cosy woodburner. Outside there is garden furniture, fire pit, outside kitchen area. There is a separate wash room with walk in shower, washing machine and sink. 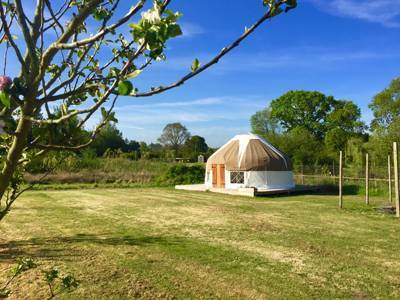 Glamping in Dorset is a great choice for a holiday whether you are looking for a family break or a romantic getaway and if you are looking for the best glamping sites in Dorset, you’ve come to the right place. 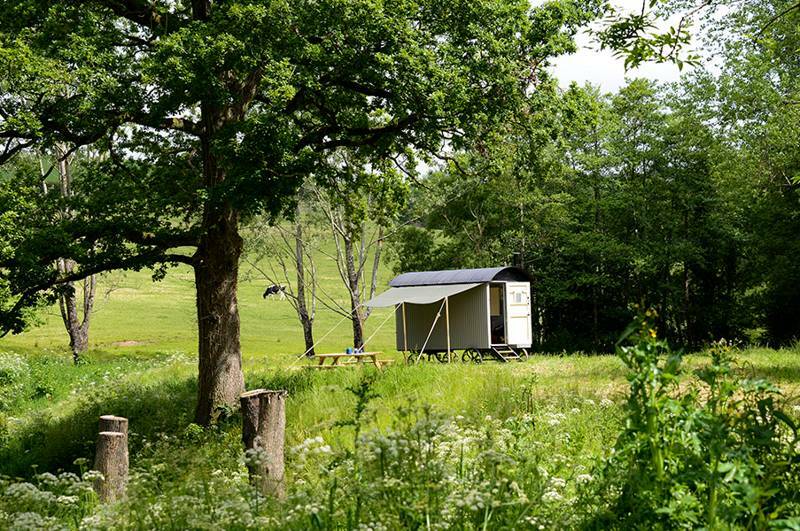 Having spent a long time researching and visiting glamping sites (it’s a hard job – but someone’s got to do it), we reckon we know what makes a fantastic glampsite and we want to share that knowledge with you. 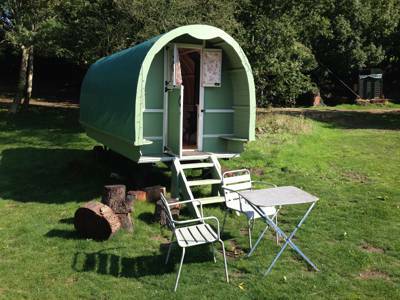 The Glampingly collection of places to stay in this south-west county includes bell tents, yurts, vintage caravans and shepherd’s huts. Stay in any of these and you’ll enjoy the freedom of a camping holiday but with added comfort and less hassle. In terms of a destination, Dorset has all the elements for great camping and glamping holidays which is why it’s been attracting people for generations: a magnificent, largely unspoilt coastline and beautiful countryside as well as the potential for great days out at its many attractions. 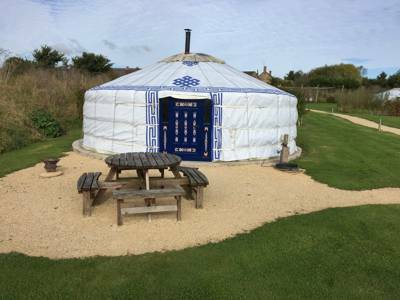 There are lots of fantastic campsites and glamping sites in Dorset in amazing locations but the great thing about glamping is that your accommodation will be set up ready for you. Not only that, but it will offer a level of luxury that beats plain old camping hands down. Forget roll mats and bumpy floors and even the familiar campsite squeak, squeak, squeak of pumping up airbeds on arrival. Glamping, more-often-than-not, offer you a proper mattress on a proper bed that will be more like your bed at home than the sleeping set-up of scout camps. 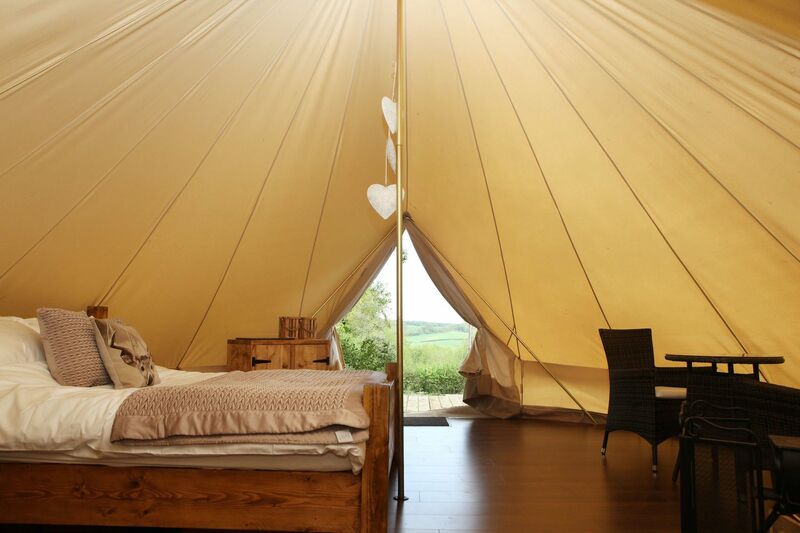 You’ll be able to choose between bell tents, tipis and yurts, shepherd huts, log cabins, treehouses and vintage caravans – each with their own charm. 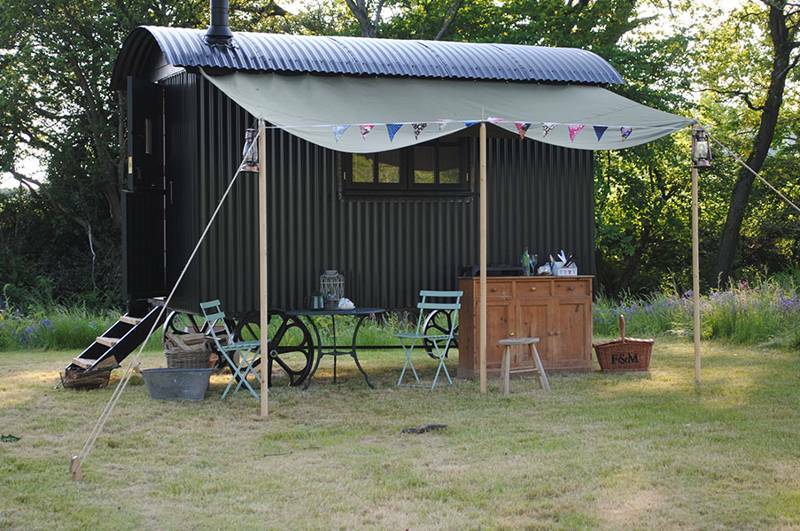 Just how luxurious you go depends on the Dorset glamping site you choose and the specific tent, cabin or caravan you book in to. Some have private bathrooms, some have log-burning stoves for added cosiness and some even have private hot tubs. Glampingly gives you the chance to refine your choice by selecting the elements that are most important to you with our “refine search” feature. There are many things to recommend a holiday in Dorset but there’s only one UNESCO World Heritage site – the Jurassic Coast. And if that’s your motivation for heading to this south west county, you’ll be looking for a glamping site near the beach. The cliffs along the coast are like a map of 185 million years of history. To the lay person this means some pretty incredible rock formations and a good chance of finding fossils on the beach. 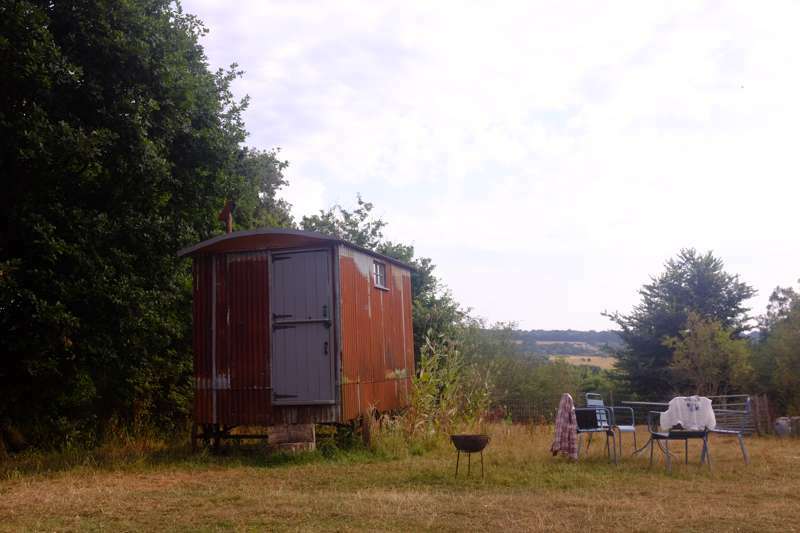 If you do choose glamping near the Jurassic Coast, or if you just fancy a day out fossil hunting while you’re glamping in another part of Dorset, Kimmeridge Bay and Charmouth are particularly good bets. You can even join organised fossil hunts from Charmouth Heritage Centre and Lyme Regis for a better chance of finding a prize specimen. Other popular spots along the coast are Durdle Door, a much-photographed limestone arch, and the nearby sheltered Lulworth Cove. Dorset loves to celebrate its most famous son, Thomas Hardy, who wrote much of his early work, including Far From the Madding Crowd and Under the Greenwood Tree, from his home in the Dorset countryside. Although he used made-up place names, the Dorset landscape is recognisable in his work to the eagle-eyed reader and the local tourist industry has been known to claim the countryside as Hardy-country. Some of the best glamping sites in Dorset are tucked away in this landscape which truly is far from the madding crowds – unless you’re in Dorset for Bestival, the annual music festival at Lulworth Estate in August, or (somewhat ironically) try to visit Hardy’s birthplace, a teeny cottage which is now a National Trust property, in the height of summer. 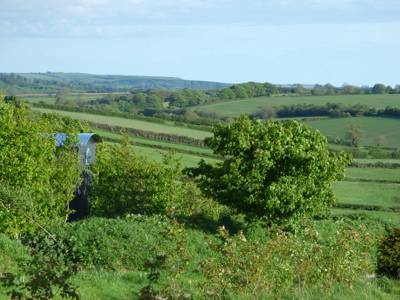 There are places where you can glamp on farms or in among the trees of orchards and with more than 40 per cent of the county falling in to the Dorset Area of Outstanding Natural Beauty, many offer fantastic views of rural scenery that stretch on for miles. Turn your eyes to the heavens at night-time for yet more impressive views. 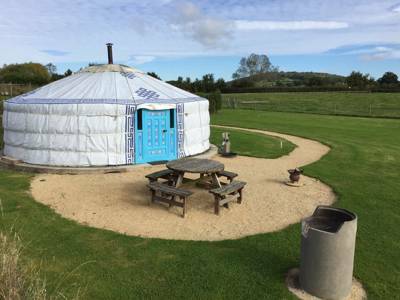 Staying in the countryside, away from the light pollution of larger towns and cities, is a great opportunity for stargazing and glamping sites where campfires are allowed in Dorset are perfect for this. 1. Go fossil hunting. Head to the beaches of Kimmeridge Bay or Charmouth to try your hand at searching for fossils. Join a guided fossil hunt or go it alone to look for treasures from millions of years ago. 2. Head out for a hike on the South West Coast Path for bracing sea views and glimpses of hidden coves and beaches. 3. Visit Corfe Castle. History buffs will like exploring the enchanting ruins of this castle, now managed by the National Trust. 4. Take the kids to Dorset Waterpark. Tantalising close to the castle, this woodland water park features inflatable obstacle courses on two lakes. IT’s a great place for families (and kids over six) to enjoy a bit of action and a lot of laughter. 5. Get a selfie at Durdle Door, an impressive limestone arch over the sea at West Lulworth that has been formed by years of erosion. 6. Walk out on the Cobb at Lyme Regis. If you fancy a trip to town during a glamping trip in Dorset, you could do worse than the seaside town of Lyme Regis which has enough attractions to keep everyone amused. An ice cream and a walk along the Cobb – the historic harbour wall for 360-degree sea views is a must. 7. Watch wildlife at RSPB Arne. A visit to this 565-hectare nature reserve on Dorset’s Isle of Purbeck is great for wildlife lovers at any time of year. If it sounds familiar, that’ll be because it was the location of the BBC’s Autumnwatch in 2016. 8. Swim in the sea! It’s not a holiday by the sea of you don’t go for a swim so brace yourselves and dive in – or at least dip a toe in. The calm, clear waters of Lulworth Cove are a good spot or, if you’re after child-friendly shallows and sand between the toes, Weymouth has a big sandy bay. 9. Visit Thomas Hardy’s birthplace. Hardy’s Cottage is where the author was born in 1840 and where he wrote some of his best-loved works. It has been preserved very much as it would have been in his day and is managed by the National Trust. 10. See the apes at Monkey World. If you’ve got little monkeys who love animals, this Dorset attraction makes for a good day out. This 65-acre site in Wareham is home to rescued and endangered apes from around the world. 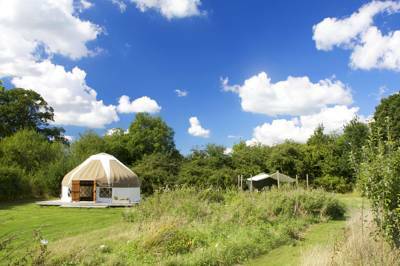 Glamping sites in Dorset, glampsites in Dorset, glamping in dorset at Glamping in Dorset, Glamping in Dorset: Search the best glamping sites in Dorset, read reviews and book your next glamping holiday at the best price.